Metamorpho and the people of Dagon Ra have finally obtained the Orb of Ra just in time for Kanjar Ro and his space pirates to arrive to take it. Will Metamorpho be able to defend the people of Dagon Ra and the Orb from Kanjar Ro’s wrath, or will they succumb to it? Multiple Multiplexes! As the Quantum Field generator begins collapsing our reality and strengthening Multiplex duplication, Multiplex is unsure which version of himself manifests the real Danton Black. We’ll need Professor Stein, Ronnie and Jason to team up as Firestorm for this one! Sugar & Spike’s lives weren’t always so full of sleazy super-heroic stake-outs. Discover the case that started it all and endeared our heroes to the superhero community—it’s the secret origin of Sugar & Spike! 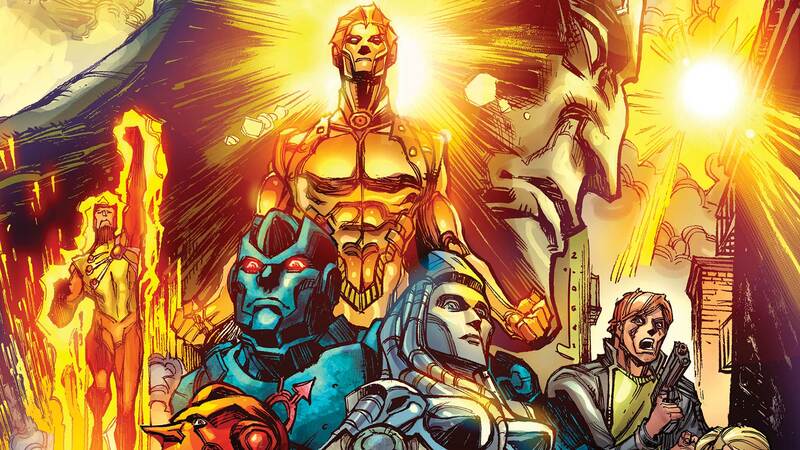 The government has unleashed its ultimate plan to get the Metal Men back—a twisted team of Metal Men bent on bringing our heroes in. Meanwhile, a looming threat waits in the shadows.